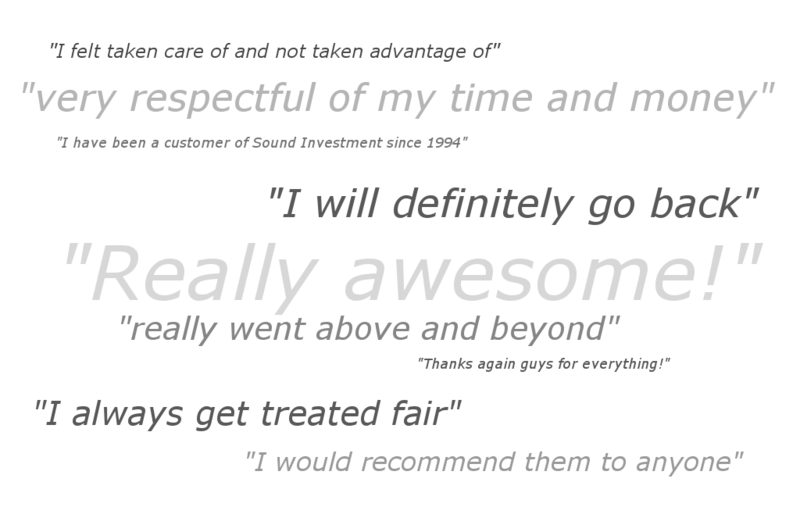 I fully recommend Sound Investment for any work. I have had several jobs done from the simplest of installs all the way up custom work, they always handle anything I throw at them the work is fast and the work is top notch! Thanks again guys for everything! Really awesome. Very friendly, very knowledgeable. Went in because my speakers stopped working and I needed a header replaced. At first they thought my speakers had blown, but they discovered it was corroded contacts, much cheaper repair they did with no hassle. Recently when my siriusXM stopped working completely for signal issues, I finally called back to Sound Investment to get it fixed. (Justin I think) said they had actually been trying to get a hold of me since they saw my yelp review months ago, but my yelp had my maiden name initial so they couldn’t find any record of an Amber O. They immediately squeezed me in for a saturday appointment as the wires had once again fallen down onto the brake pedal. He apologized profusely as they would never want someone driving around with the loose wires and they wish I had called earlier to get them fixed. So I felt like a bit of a jerk.